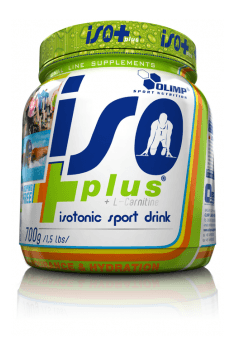 Olimp Iso Plus® Powder is a concentrate of isotonic drink, which is intended to supplement the water, electrolytes, vitamins, minerals and carbohydrates which were lost during training. The product has been enriched with L-carnitine, which supports deriving the energy from fat and effective fat burning. The advantage of the product is its attractive taste and high efficiency. L-carnitine is a natural vitamin-like substance, present mainly in skeletal and cardiac muscle cells. Determines the transport of the long chain fatty acids resulting from the disintegration of fat through the membrane into the mitochondrial matrix, where they undergo β-oxidation process (‘burn’). The β-oxidation products serve as substrates for further metabolic processes that result in ATP, which leads to increased energy levels and has a positive effect on training parameters. During an intense physical exertion, the demand for L-carnitine increases and exceeds the body's ability to synthesise it. Therefore, especially during a long-term endurance training, the L-carnitine amount should be filled up with its adequate supplementation. Carbohydrates (mono-, di- and polysaccharides) prevent decreases in blood sugar level during exercise and enable reconstruction of the muscle glycogen stores, which reserves decrease during exercise due to the release of glucose. The depletion of glycogen reserves is manifested by a feeling of tiredness and a decrease in the energy level, and, as a result, the inability to continue exercising. Minerals (potassium, calcium, magnesium) allow an optimal hydration of cells. Electrolytes, besides carbohydrates, are necessary for absorption of the energy components, glycogen regeneration and proper muscle work – the muscle fiber contraction and energy production. Minerals participate in the processes of thermoregulation and proper functioning of the nervous system. While sweating the body loses not only water but also valuable electrolytes. An intensive training increases the need for minerals, even without sweating. B vitamins are essential for the proper functioning of the nervous system and optimal metabolism of nutrients - proteins, fats and carbohydrates. They serve primarily enzymatic functions. They normalize cholesterol levels, regulate blood glucose levels and participate in the production of ATP. They affect mental performance. Vitamins from group B are water-soluble compounds - their possible excess is excreted in the urine, hence they should be regularly supplemented to the body. Antioxidant vitamins (A, C and E) protect the body against the excess free oxygen radicals and lipid peroxides, increasing the antioxidative potential of the body. Excess free radicals affect the faster aging of the body, damage cellular structures and promote the development of atherosclerotic lesions. Antioxidants affect the strengthening and improvement of blood vessels elasticity and promote the proper oxygenation of cells. They are an important element of daily pro-health prophylaxis. Vitamin D is essential for the proper functioning of the skeletal system and bone mineralization process. It administers calcium-phosphate economy, by increasing the absorption of calcium, the compounds of which are the basic building blocks of bones. In addition, it has immunomodulatory and anti-inflammatory properties and has a positive effect on the muscle work and regeneration. In summary, Olimp Iso Plus® Powder effectively supplements the lost electrolytes and carbohydrates, supports the post-workout regeneration and takes care of the optimal hydration of the body. The product is recommended for athletes, especially for long-term exercising and endurance sports, for physically active people and those who perform physical work. Take according to the needs, especially during competitions, intensive trainings and hard physical work. Dissolve 17,5 g of powder (2 tablespoons) in 250 ml of boiled water. Mix. Drink immediately after preparation. The preparation is recommended with the aim of hydration in case of physical activity lasting longer than 60 minutes. Moreover, the preparation should be used 30 minutes after initiating this activity. Sugar, maltodextrins, glucose, fructose, acidity regulators (citric acid, malic acid), thickeners (gum arabic, xanthan gum, sodium carboxymethylcellulose), flavors, sweeteners (sucralose, acesulfame K). dyes - riboflavin (for lemon flavor), beta-carotene (for orange, orange grapefruit flavor), E133 (for tropic blue taste).